Well, the Nashville Predators have done it again. Against all odds (or at least the Model’s odds), the Preds have punched their ticket to the Stanley Cup Finals, where they will meet the reigning Stanley Cup Champion Pittsburgh Penguins. While Nashville has continually defied logic by beating the Model, in their toughest test yet, the Model has them as heavy underdogs once again. So, why has the Model consistently picked against the Predators? First off, the Predators were the last seeded team in the West, so it should not be surprising that they are the underdog in most playoff matchups. Additionally, it hasn’t been their offense that has blown teams away, but, rather, their ability to hold teams to under two goals per game (and those were teams with Patrick Kane, Jonathan Toews, Ryan Getzlaf, etc.). While there is a popular narrative of riding a hot goalie in the NHL Playoffs, our data has shown that previous strong goaltender play is not predictive of future strong goaltender play. A few areas where the Model has some holes when it comes to the Predators are (1) the Model does not factor in any sort of ELO Rating to adjust for recent big wins, and (2) the Model does underestimate the Predators D core. None of Josi, Subban, Ekholm, or Elias put up over 50 points this season, and the Predators as a team were about league average on goals allowed per game. Despite the impressive playoff efforts of Josi, Subban, Ekholm, and Elias thus far, the Penguins are offensively are superior to any team the Predators have faced (averaging the most goals per game in the playoffs) and have ample playoff experience blended with young talent. Below is our updated playoff bracket. Again, we build our bracket by advancing the team with the higher win probability for each series. The probabilities are generated from the average of our NHL playoff models, which use team-level and individual player statistics to predict the probability that a team will win a given series. 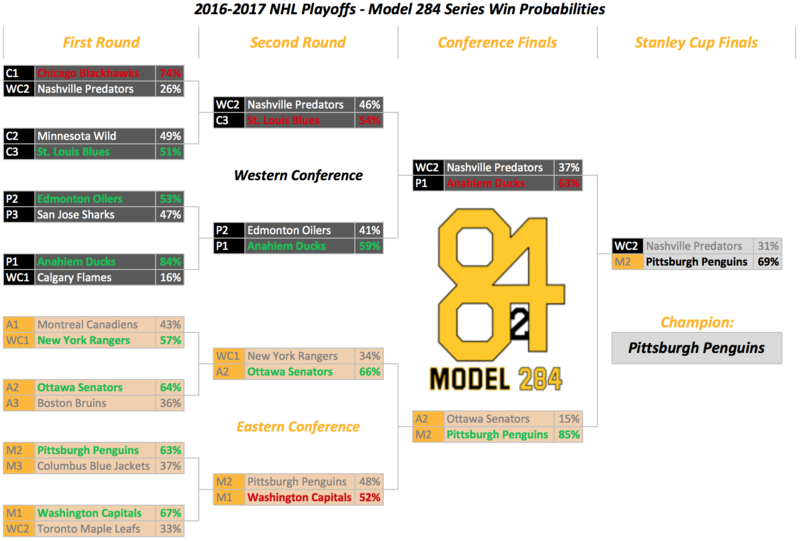 For more information on the Methodology behind the NHL Playoff Model, see here.